Wide-band rings can be very flattering on your hand, and they offer a more substantial look when it comes to bridal jewelry. You'll find wide band diamond engagement rings in several different styles, as well as men's and women's wedding bands in wider widths. No matter which style you choose, you'll love the major impact this type of band can make. Whether you want a simple diamond solitaire or a more elaborate design with several diamond accents, you'll find that many styles are available with a chunky band. The choice is mostly a matter of personal preference. Wide Pave Diamond Band - This gorgeous ring from Amazon features a center round diamond bezel-set amid a delicate wide filigree band. The 14k white gold band is set with dozens of additional round diamonds for a total carat weight of 1.20. This pretty engagement ring retails for $4,300. White Gold Diamond Engagement Ring - This lovely ring from Jared is made up of two carats of diamonds in various sizes and shapes. The centerpiece is an invisible setting of four princess cut diamonds. These are surrounded by a frame of smaller round diamonds and rows of baguette and round diamonds, all on a wide 14k white gold band. This ring retails for about $4,000. Ramona Wide Band Engagement Ring - This exquisite design from Asha Diamonds features a center diamond prong-set atop a 14k white gold pave band with 0.96 carats of additional diamonds. 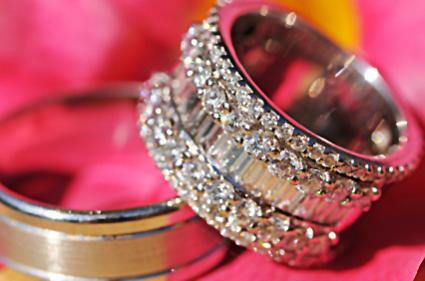 You can select from several different precious metals, as well as a variety of shapes and sizes of diamonds. This ring starts at about $1,700. White Gold Wide Band Solitaire - This simple ring from Diamonds-USA features a 0.41-carat round diamond set in a simple wide 18k white gold band. The ring has a brushed finish for a subtle glow and retails for about $1,700. Two-Piece Diamond Engagement Ring Set - This bridal set from Amazon includes a five-millimeter-wide, 14k white gold engagement ring with a round-cut center diamond and smaller diamond accents. The matching white gold wedding band features similar diamond accents, giving the set a total carat weight of 0.17 carats in accent diamonds. It retails for about $935. Mozart Smart Value Bridal Set - This pretty set from Helzberg Diamonds boast three carats total weight of diamonds set in 14k white gold. The wide-banded engagement ring features an invisible setting with four princess cut diamonds surrounded by dozens of round diamonds. The wedding band further adds to this substantial ring with a row of more round diamonds. The bridal set retails for about $5,500. Milgrain Diamond Wedding Band - This show-stopping ring from Helzberg Diamonds showcases a delicate engraved design on its wide, 14k white gold band. 1/4 carat of tiny diamonds accent the engraving and give this ring amazing sparkle. It retails for $1,000. Platinum Antique-Style Diamond Wedding Band - This eight-millimeter-wide platinum band is studded with 49 tiny diamonds for a total carat weight of 0.49. The gorgeous antique-style openwork design keeps this ring from looking too overwhelming, and the sparkle of the diamonds is intense. This ring retails for $2,900. Men's White Gold Diamond Band - This 10-millimeter 10k white gold band from Jared features half a carat of round diamonds channel set in a double row on each side of the wide band. The brushed texture of the center surface offers subtle sheen. This ring retails for about $1,300. Allurez Me Channel Set Wide Wedding Band - This wide 14k white gold band from Sears has a beautiful brushed finish and features 12 round diamonds set in vertical channels around the band. It retails for just under $2,000. Men's Three-Diamond Ring - Featuring a center accent of three princess-cut diamonds with a total weight of 1/4 carat, this chunky 10k white gold ring is a unique choice for any groom. The back of this ring is tapered, making it more comfortable than many other similar designs. It retails for about $1,300. Whether you're looking for an engagement ring, a bridal set, or a wedding band, you've got a wealth of options when it comes to wide bands. From delicate openwork designs to chunky brushed metals, these rings are stunning and substantial. Take your time choosing a design you'll love for the rest of your life.